The French public were expecting to hear from their president last night, but not like this. President Macron was scheduled to give a national address to announce the first concrete measures arising out of the Grand Débat, a period of public consultation following the yellow vest protests last winter. Instead spoke to the French people live from Notre Dame, as fire-fighters battled to save the 800 year-old gothic cathedral from being completely destroyed. Notre Dame. 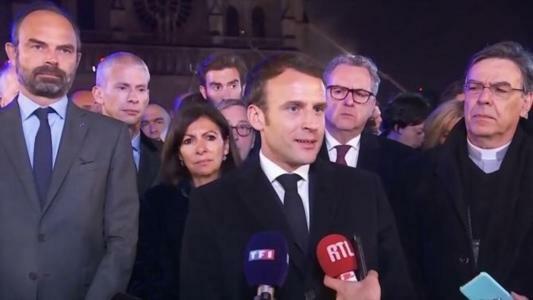 This focal point of French “history, our literature, part of our psyche, the place of all our great events, our epidemics, our wars, our liberations, the epicenter of our lives…we will rebuild it together,” announced the French premier. A little before 7pm, as the president was about to record his speech from the Elysée, news of the fire arrived. The blaze quickly spread through the wooden beams holding up the roof to the spire which, by 8:15pm, had collapsed along with the entire roof. Some 500 members of the fire brigade spent the following hours battling to contain the fire. A little after midnight the president, with the mayor and archbishop of Paris by his side, announced that, thanks to the efforts of the Paris fire-brigade, the worst had been avoided: the fire had been brought under control and the main structure, including the iconic towers on the west façade, had been saved. President Macron issued an international appeal for donations to repair the cathedral, which could run to a billion euros and last over a decade. By Tuesday morning two of France’s wealthiest men, François-Henri Pinault and Bernard Arnault had pledged a combined 300 million euros. The Dutch firm strengthens its banking and finance practice and creates a customs, trade and logistics department. The German firm chooses the Grand Duchy for the opening of its first international office.